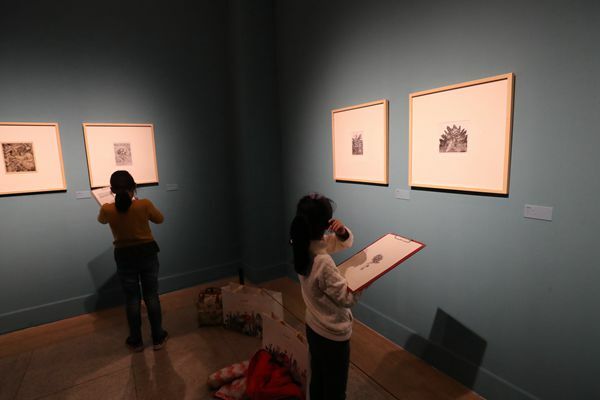 BEIJING -- The National Museum of China is staging a series of exhibitions during the Spring Festival, or lunar Chinese New Year, attracting more than 60,000 visitors a day on average, figures from the museum show. Launched in November, the exhibition to commemorate the 40th anniversary of China's reform and opening-up remains open during the seven-day Spring Festival holiday. Its total number of visitors has exceeded 3.4 million. The Bronze Tiger Ying, a looted Chinese bronze vessel, is also on display. The vessel that dates back to the Western Zhou period (1046 BC-771 BC) was auctioned in April 2018 by Britain's Canterbury Auction Galleries and was later shipped back to China in November and added to the museum's collections in December. Drifting abroad for 158 years, the vessel finally managed to enjoy its Spring Festival at home, said Wang Chunfa, curator of the museum. A calligraphy and painting exhibition was jointly launched by the museum and the Chinese Calligraphers' Association, with famous calligraphers on site to create Spring couplets for the audience. Several international exhibitions that China jointly launched with Japan and France are open to the public to show that civilizations can learn from each other through different perspectives, according to Wang. Meanwhile, a series of creative products, such as calendars customized by the museum and lollipops featuring colored porcelain from the Ming and Qing dynasties, are available to the public. All public education activities at the National Museum of China are free of charge during the Spring Festival holiday.